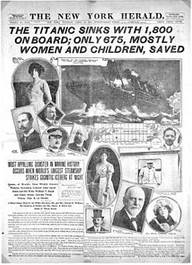 Today is the 101st anniversary of the sinking of the supership RMS Titanic. Two hours and forty minutes after hitting an iceberg in the North Atlantic, the vessel sank at 2:20 am. Only 710 of the 2,227 passengers survived.